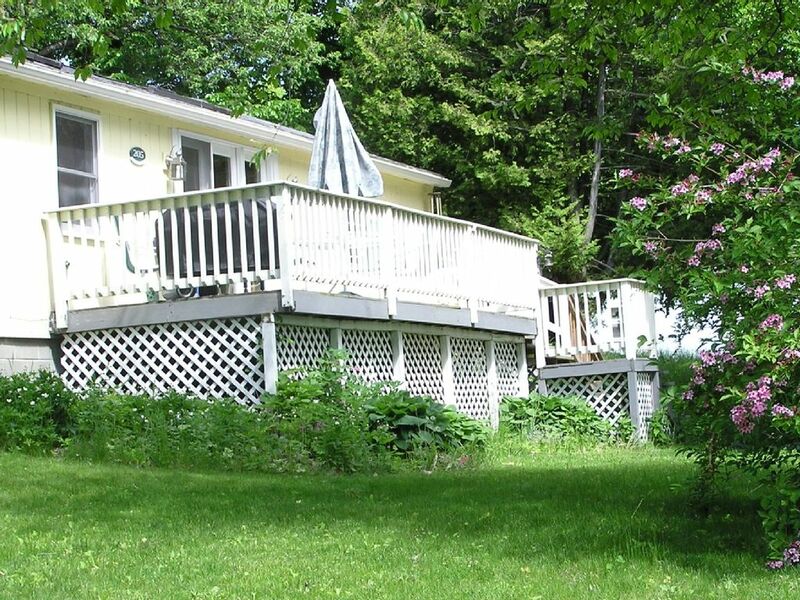 This lake view cottage has all of the modern conveniences of home with beautiful Lake Champlain views. The kitchen has been recently renovated with new wood floors. Our cottage is located 15 minutes from Burlington on Mills Point in Colchester, Vermont. It is conveniently situated near the Burlington bike path and the Colchester causeway. Lake access is across the road where the water is clear and shallow enough for young children. There is a mooring available for your boat and a grassy beach for sunning. The community of Mills Point is friendly and welcoming. The Fall foliage is spectacular both on the Point and in the area. There are amazing scenic drives into the mountains around Stowe and beyond. There is lovely mountain hiking nearby and natural areas within walking distance. In the summer you can pick strawberries and blueberries and in the Fall apple picking is available. I lived in Burlington for 27 years before moving to Boulder, Colorado. I raised 3 children in Vermont and still consider it my home. Our property is unique in that our community of neighbors is special. Many of the folks on Mills Point live here year round. They are friendly, kind and generous and I consider myself lucky to be able to come home to such a place. Mills Point is close enough to Burlington to feel cosmopolitan and far enough away to feel like a getaway. I love my cozy home on the lake and look forward to spending more time here in the future. I hope you enjoy your stay as much as I do. Access to the lake is across the street. Beautiful sunrise view over the lake. Across the lake there are views of Camel's Hump and Mount Mansfield. We have mooring for your boat across the street. We had a wonderful stay in this lovely lakeside cabin. The views were beautiful! We took some lovely walks along the causeway and around Mills Point. This cabin is well stocked and we felt right at home. The mattress and pillows were comfortable! This is not something I’ve been able to say previously about my VRBO stays. Close to absolutely everything! Wonderful home with a fantastic view of the lake. on and a grill to use if not going to many of the close restaurants. Our reunion was made perfect because of this property, thanks so much for allowing us to be your guests. Thanks Carolee and Louis. I am so glad that you had fun! Very comfortable and clean. Great view of the lake and Mt Mansfield. Close to the bike path. We enjoyed staying at Helaine's cottage on the lake. There is a nicely stocked kitchen, comfortable seating area inside, and a table and chairs on the patio. Its a little tight to sit 6 around the tables. The beds were comfortable, and the AC was great for hot nights. Helaine was quick to respond to any concerns or questions. Thank you Diane. Please come again. House was well equipped and location was great. Very close to the bike trail! This was the perfect location. The house was clean and cute with fresh decor. We had everything we needed. The water access was perfect for kayaking. Eating on the deck was a joy. It is convenient to downtown Burlington but far enough away do it is quiet and peaceful. It's a perfect location! Thank you for a great stay!! Our cottage is located in a rural setting close to a town, a city, mountains, biking, hiking, boating and swimming. There are many arts and crafts shows and festivals in the region throughout the spring, summer and fall. There are numerous live theater productions and concerts in and around Burlington and in Stowe.